When in the market for a rear bumper for your Wrangler JK look no further then DV8. The RS-11 Rear Bumper brings a beefy off-road look to your Jeep that will protect your Jeep from off-road debris. The built in D-ring mounts offer additional recovery points while the class III hitch is rated for 3500lbs. towing. Included are flush mount back up LED lights for extra lighting when you are on the trails at night. Construction: 3/16" & 1/4" cold rolled steel will keep this bumper holds up from off-road obstacles. High degree angles will give you more room when rock climbing along with D-ring mounts as added recovery points. Full width coverage for a heavy duty look. 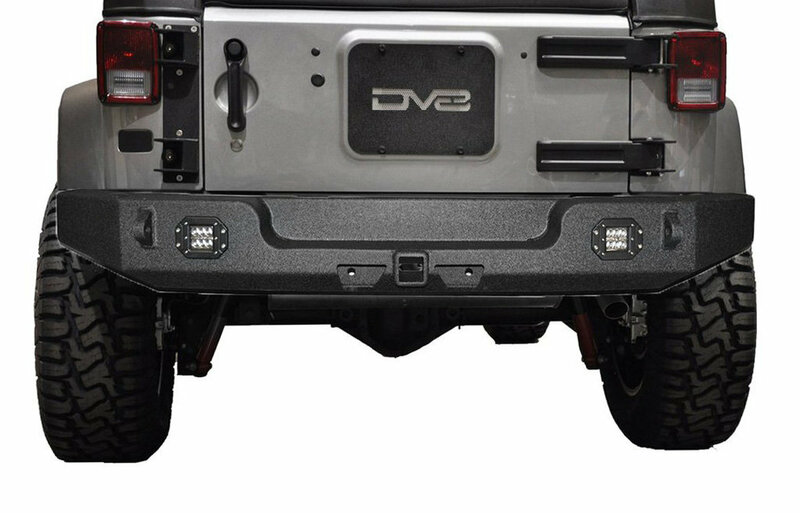 Features: This rear bumper comes with flush mount LED back up lights preinstalled, D-rings & a class III hitch (rated to 3500lbs.) for more recovery points and added light when backing up. Bolt on Installation: No modifications will be needed to your Wrangler JK to install this rear bumper. Simply just bolts on to the factory bolt locations. Hi, what is the weight of this bumper? Thanks.